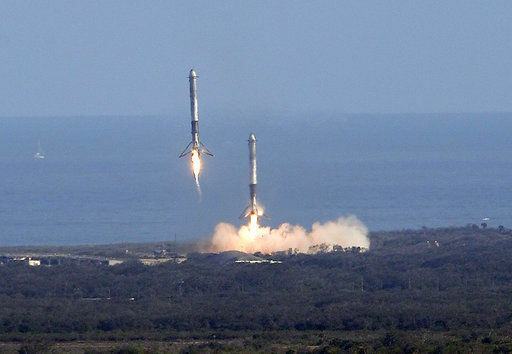 Two of the boosters— both recycled from previous launches — returned minutes later for simultaneous, side-by-side touchdowns on land at Cape Canaveral. Sonic booms rumbled across the region with the vertical landings. A few hours later, SpaceX chief executive Elon Musk told reporters that the third booster, brand new, slammed into the Atlantic at 300 mph and missed the floating landing platform, scattering shrapnel all over the deck and knocking out two engines. 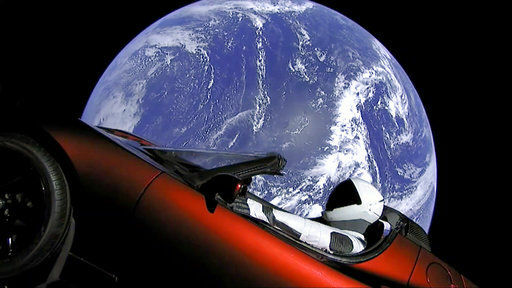 Minutes later, he provided a <a href=”https://www.youtube.com/watch?v=aBr2kKAHN6M” target=”&mdash;blank”>livestream</a> of “Starman” tooling around the blue home planet, looking something like a NASCAR racer out for a Sunday drive, with its right hand on the wheel and the left arm resting on the car’s door. “Woohoo!” Bezos tweeted after the launch.